Nicholson's (Mitchells and Butlers) pub in Soho. 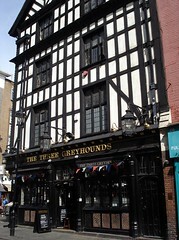 Perched on the corner of Greek Street and Old Compton Street, the mock-Tudor frontage of this pub makes it stand out. It's quite small inside, consisting of a single room with a varnished wood floor, seating for around 30 people, and standing room for a few more. Around a third of the seating is at high tables, and of the remaining seating, only one of the tables is really suitable for more than two people. Stools are padded leather, and tables are dark wood. The windows are leaded in small rectangles, but the glass is plain. A gantry hangs above the bar. There may be a dining room upstairs, but if so it was closed on our September 2012 weekday lunchtime visit. In good weather, there's also a table and couple of chairs outside on the Old Compton Street side. Kake visited on a Thursday lunchtime in September 2012. There were five real ales on: Cropton Hawaii 340 (£3.85/pint), Thornbridge Jaipur, St Peter's Mild, Windsor & Eton Knight of the Garter, and Doom Bar. There were around 8 other customers in during my visit, though this includes some turnover. At least as many people also came in just to use the toilets (some of them even asking the barstaff first if this was OK). Music was playing: The Beatles, Red Hot Chilli Peppers, Alicia Keys. According to their website as of September 2012, food is served 10am-10pm Mon-Sun from a standard Nicholson's menu photo of menu as of the same month. In September 2012, Kake tried the roasted vegetable tart (£9) photo, which was advertised as a "shortcrust pastry tart filled with caramelised onions, beetroot, butternut squash, mushrooms and asparagus, with a tomato dressing". It had an interesting construction; the vegetables were cooked separately and piled in layers into the crisp pastry shell, which worked quite well. The beetroot was absent, replaced by carrot. The asparagus was quite stringy, and the butternut squash was inconsistently cooked, with some pieces being very soft but others on the verge of undercooked. The accompanying watercress salad had a slightly too high proportion of stalk. The tomato dressing was quite flavourful (though with a slight aftertaste of "jar"). Overall though, it was fine for chain pub food. Kake's verdict: I'd come in again for a drink, though not at peak times. I probably wouldn't bother with the food again, especially as it's so close to Chinatown, and the menu is the same as at other Nicholson's pubs. Accessibility: A ramp to get in, but the toilets are in the basement, down a steep, narrow, winding, low-ceilinged flight of stairs with a sturdy handrail some but not all of the way down on one side. Last edited 2014-09-14 19:49:57 (version 4; diff). List all versions. Page last edited 2014-09-14 19:49:57 (version 4).